This morning I decided to walk the Crider Avenue Nature Trail that was dedicated in late October of 2017. W.E Quicksall and Associates engineered the project, A Clean Ohio grant partially funded the $90,000.00 project, and Tuscon was the contractor who built the trails. It is maintained by the New Philadelphia School system and the City of New Philadelphia. It is also used as a classroom for the students of New Philadelphia. First impressions were how clean the surrounding area was. There are adequate bins for the disposal of waste at the head of the trail which also has plenty of off road parking which is graveled in limestone. The trail material itself is fine gravel which is very well compacted. 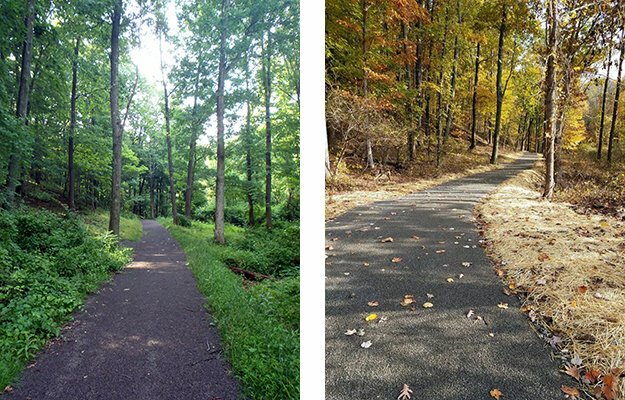 The photos show the beauty along the trail in any season. Benches are strategically placed before the more demanding areas. I am in good health but not young by any means, and was not pushed to any limits I might have. There are an abundance of birds who will let you know you have entered their territory. I saw no deer but there was evidence of deer tracks across the gravel trail. This is a trail that will definitely reveal its beauty in any season. Which is why this trail should be traveled often.